A mid-infrared mosaic image from the Stratospheric Observatory for Infrared Astronomy, or SOFIA, offers new information about processes of star formation in and around the nebula Messier 42 in the constellation Orion. The image data were acquired using the Faint Object Infrared Camera for the SOFIA Telescope, or FORCAST, by principal investigator Terry Herter, of Cornell University during SOFIA’s Short Science 1 observing program in December 2010. SOFIA’s view combines images at mid-infrared wavelengths of 19.7 microns (green) and 37.1 microns (red). The latter wavelength cannot be accessed by any telescope on the ground or currently in space. Detailed structures in the clouds of star construction material can be seen, as well as warm clouds of dust and gas surrounding, and partly obscuring, a cluster of luminous newborn stars at upper right. The left and center panels of the three-image comparison have the same scale and orientation as the SOFIA image. The image in the left panel, made at wavelengths visible to the human eye, shows dense clouds of interstellar dust blocking our view into parts of the star forming region, plus the rosy glow of hydrogen gas excited by radiation from the young stars just above the center. 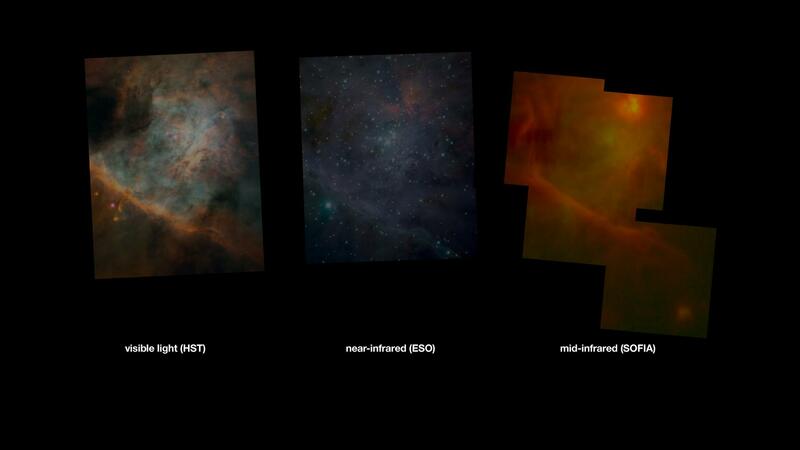 In the center panel, the near-infrared image penetrates some of the dust and reveals numerous stars at various stages of formation, embedded inside the clouds. SOFIA’s observations reveal distinctly different aspects of the M42 star formation complex than the other images. For example, the dense dust cloud at upper left is completely opaque in the visible-light image, partly transparent in the near-infrared image, and is seen shining with its own heat radiation in the SOFIA mid-infrared image. The hot stars of the Trapezium cluster are seen just above the centers of the visible-light and near-infrared images, but they are almost undetectable in the SOFIA image. At upper right, the dust-embedded cluster of high-luminosity stars that is the most prominent feature in the SOFIA mid-infrared image is less apparent in the near-infrared image and is completely hidden in the visible-light image. appears to have several stellar bodies or concentrations within it.. which considering the position and the shape of the rest of the nebula as given in the visible light and near IR images, appears to be where the ‘focus’ of star forming activity is occurring?